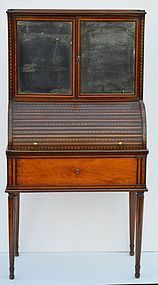 Rare diminutive Neo-Classical inlaid lady's desk with tambour cylinder section and fine inlay. Mirrored doors and writing section pulls out. 28" wide, 15" deep, 53" high.